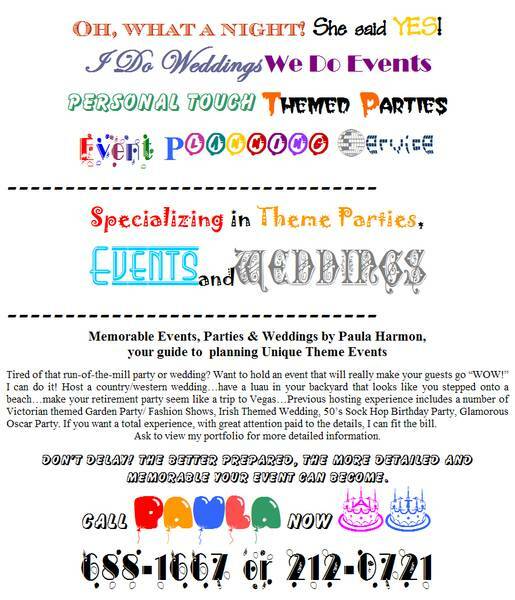 Wouldn't you love your wedding to look tasteful and elegant, like this wedding planner's ad? Oh, what a night! She said YES! Tired of that run-of-the-mill party or wedding? Want to hold an event that will really make your guests go “WOW!” I can do it! Host a country/western wedding…have a luau in your backyard that looks like you stepped onto a beach…make your retirement party seem like a trip to Vegas…Previous hosting experience includes a number of Victorian themed Garden Party/ Fashion Shows, Irish Themed Wedding, 50’s Sock Hop Birthday Party, Glamorous Oscar Party. If you want a total experience, with great attention paid to the details, I can fit the bill. Ask to view my portfolio for more detailed information. DON’T DELAY! The better prepared, the more detailed and memorable your event can become. 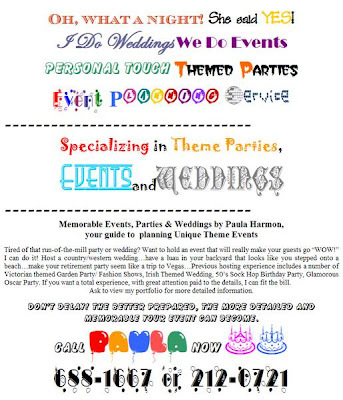 And to prove this wasn't an accident, here's her flier, illustrating the point that just because you HAVE fonts and clip-art, there's no reason to use them all on one page.